Grooms will now take centre stage as they get ready for their big day withHameedia. Sri Lanka’s leading menswear specialist recently introduced ‘The Grooming Studio’ – a total range of grooming solutions under one roof for grooms-to-be. Available at Hameedia showrooms island-wide, and run by Hameedia’s expert team of grooming consultants, ‘The Grooming Studio’ enables grooms to be completely wedding-ready and look their absolute best on the most important day of their lives. 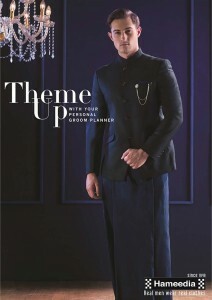 Hameedia will now offer the discerning groom two main typed of suit ranges at the ‘The Grooming Studio’. The Premium Suit range, which is available at the Envoy Mansion and all Hameedia outlets, includes four high-end suit packages, namely the Luxury Package which is priced at Rs. 500,000, the Esteem Package which is priced at Rs. 325,000, the Smart Package which is priced at Rs. 175,000 and the Classic Package which is priced at Rs. 100,000. The second range, the Budget Suit range, which is available at all Hameedia outlets comprises three suit packages, including Package 1 which is priced at Rs. 80,000, Package 2 which is priced at Rs. 60,000 and Package 3 which is priced at Rs. 40,000. Both the Premium Suit range and the Budget Suit range will be on offer until the 31st of August, 2018. Each of the packages feature timeless staples and suits made from the finest fabrics and adorned with plush finishes and embellishments. Hameedia also recently introduced a 6-12 month interest-free instalment scheme via Sampath Bank, for any suit within the price range of Rs. 10,000 – Rs. 250,000, in an effort to provide more flexible payment methods to its clientele. With its wide and exclusive range of tuxedos, linen suits, wedding national kits and wedding kurtas, Hameedia is able to meet the needs of any type of wedding, whether it’s a spectacular event on the beach, a lively Indian celebration, a vibrant traditional ceremony or a grand ballroom affair. In addition, Hameedia offer Bespoke Gifting solutions in this wedding season. Customers can include products from Hameedia, including gift vouchers or products from another supplier or even personal item, which they want to include – and Hameedia will create a delightful gift pack. The menswear brand is going the extra mile by offering its services to source any product or item as per customers’ requirements for added convenience during the busy season. This offer will allow customers to design personalised gift packs for their loved ones. The offer is valid until 31st August 2018 at selected Hameedia showrooms. Established in 1949, and with nearly 70 years of experience, Hameedia has grown to become a pioneer in the Sri Lankan retail fashion industry. The fashion store is renowned for delivering high quality custom tailoring under the bespoke category and ready-made clothes for gentlemen. The Hameedia, multi-brand retail stores house a collection of quality menswear brands such as Le Bond, Envoy London, Signature, Van Heusen, Louis Philippe, Park Avenue, Raymond, Lee and Adidas to name a few. Hameedia also prides itself on offering outstanding level of service to ensure that all clients enjoy a shopping experience that is positive and personalized. With a network covering most of the major cities across Sri Lanka and a large and experienced team, Hameedia has a strong local presence and has also extended its operations to the global fashion industry. For any inquiries, please contact the Hameedia team on +9477 787 3536 or +94 77 357 9415.